Having larger rooms in our new location has allowed us to add couples massage to our already existing massage treatments, which was very exciting when we opened our doors just before Valentines Day in 2014! This gives our clients the option to have there own private room, or to enjoy a massage with their partner. I was previously an instructor of Massage Therapy at Southwestern College in Florence, KY. I enjoy teaching new students the art of massage, as well as the science of the body. 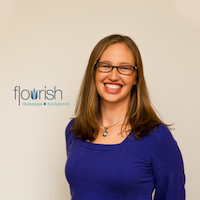 I decided to dedicate all of my time now to run a private massage therapy practice, servicing clients across Cincinnati & Northern Kentucky, along with other very skilled Massage Therapists. My mission is to utilize massage therapy practices as a way to encourage each client’s journey towards healing the body, mind and spirit. Together we can create an environment conducive to holistic healing, and work to find any underlying issues that may be creating discomfort in the body. I aim to reach a level of communication with every client that enables us to gain a greater understanding of individual needs. Together, we can work to achieve full balance in the body.